One of Jopling’s finest shots, four balls go in rotation on the snap. Start with the edge of the 2 ball one-half to one inch ahead of the foot spot. Freeze the 3 to the 2 in line with diamond 7. Align the 1 and the 2 into the right side of the corner pocket. Freeze the 4 to the 3 dead in the middle of the left side pocket. Tap the balls frozen. Position “snow” near the head string as indicated and hit the shot with a fairly hard draw stroke. 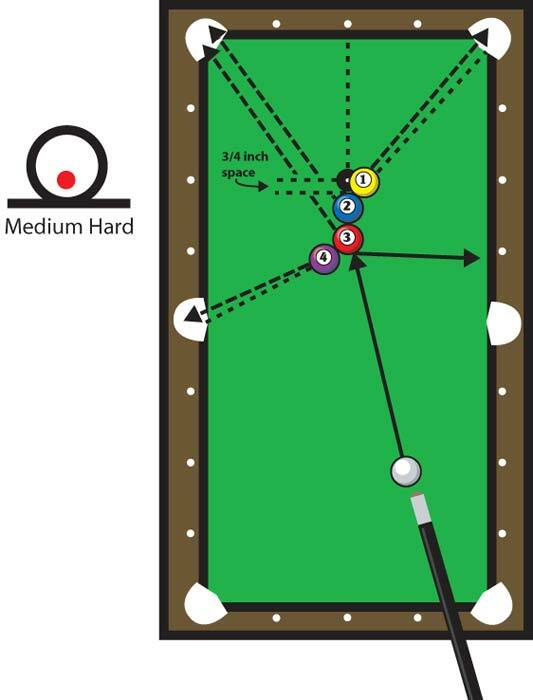 If the 4 ball throws into the rail wet the contact point between the 3 and the 4. You must hit the 3 ball as full as possible without hitting the 4. Shazam!